There is currently much debate amongst historians, architects and the theatre community, about the relationship between theatres and placemaking. That is the recognition that they are not just about the bricks and mortar (or fly galleries and orchestra pits) but are also about the people who use them and the places where they are situated. While there is a view that ‘theatre can be created anywhere’ (and of course it can be), in socio-economic and regeneration terms it must be acknowledged that theatres are important to the communities they serve and physical environments where they are based. In fact, in these times of austerity, theatres, like libraries and community centres, can find that sources of financial support (in the form of regular budget allocations and grants which help ongoing revenue costs) become increasingly precarious (if not non-existent). In such circumstances, it is vital that in terms of function, accommodation and aspiration, theatres remain relevant to the communities they serve and in return help enrich and sustain those communities. Therefore, when precious funding does become available (from local or national government, the Arts Council, the Heritage Lottery Fund, private organisations, charitable trusts, or more usually a combination of the above) to invest in capital projects to re-vamp, restore or reinvigorate a theatre, it is vital to remember that the theatre is a ‘vital organ’ within its local context and that it has a symbiotic relationship with the community it serves. In other words, if the theatre does not deeply engage with the needs and aspirations of its communities, it will over time become less relevant and ultimately struggle to be financially sustainable. To be a success, a theatre needs to adapt to survive. Stakeholder engagement increasingly reveals that a theatre that is only a place for performance is not considered enough. To continue to contribute to placemaking, theatres are increasingly being asked to provide other facilities such art galleries, restaurants, bars and cafes, museums, interactive experiences, public rehearsal facilities, children's education and play facilities, function suites and community meeting spaces (and the list goes on!). Add to this the fact that theatres are often at the centre of a city or town’s heritage and are characterised by iconic designs. For old theatres, there is often an uneasy relationship of trying to combine the functionality, accessibility and commercialty required by the community without compromising the existing historical, magical and creative space for audience and performers. Presented with such challenges, the role of the architect becomes crucial in creating the accommodation mix which theatre directors need, audiences enjoy, and the community demands. 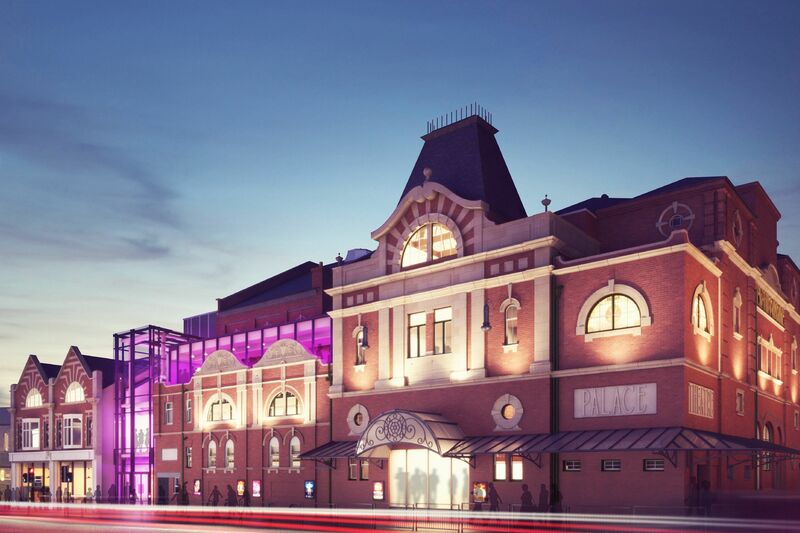 At Space Architects we have worked on some outstanding and unique theatre projects including; Newcastle’s Live Theatre, Darlington Civic Theatre, The Hullaballoon Children's Theatre, Théâtre Sans Frontières in Hexham, Hull New Theatre and the Home Theatre in Manchester. Each project throws up different requirements and challenges, but a key consideration for these schemes is how to sensitively provide contemporary state-of-the-art performance spaces and the facilities demanded by the community while also maintaining – and often enhancing- historical features. For certain cases, this means vastly improving the facilities within existing listed buildings. This was true for the Grade II listed Live Theatre on the Newcastle quayside which was revamped to incorporate a restaurant and new office space on the ground floor. The complete refurbishment of the premises resulted in a more spacious foyer, new box office, larger bar and restaurant. Importantly for the customer experience, the auditorium was much improved with more comfortable seating, air conditioning and a better view of the stage. Such issues were also central to our designs for the extensive remodel, extension and refurbishment of Darlington Civic Theatre – another Grade II listed building. Resolving the confusing entrance strategy and making the theatre more accessible for all potential audience members were key aspects of this project. Central to our strategy was the provision of the essential front of house facilities that stakeholder consultation had revealed that the town in general, and the local community in particular demanded. These included a café, bars, art gallery, heritage gallery, education room, function room and a historical archive. At the same time, new state-of-the-art performance and technical facilities, as well as a new scene dock, get in area, and dressing rooms were accommodated in a purpose built extension. This allowed the original theatre and auditorium to be sensitively restored to its original Edwardian splendour, while at the same time increasing the seating capacity and improving sight lines. Although a theatre was from a different period (circa 1939), similar principles of improved audience and technical facilities with an overall increase in capacity were also applied to the Hull New Theatre. On other occasions, completely new theatres are created within redundant historically significant buildings, whether that be listed accommodation or building within a Conservation Area, or both. For example, we have partnered with Hexham-based Théâtre Sans Frontières on designs to transform a disused railway goods shed and listed water tower into rehearsal space and flexible accommodation capable of hosting exhibitions, media presentations, live theatre and music events (all of which are considered missing from the facilities in the area). The design of the Hullaballoon Children’s Theatre in Darlington raised similar challenges due to it being situated in a former fire station in a Conservation Area. A 150-seat flexible theatre studio space for children between the age of 0 and 12 was needed that was warm and welcoming. With developments such as these, proposals must often satisfy local planning and conservation criteria as well as Heritage Lottery and Arts Council requirements. Care is needed to ensure that the requirements are met while still being able to provide the facilities needed by the theatre production company and community alike. While the above examples address the upgrade of established theatre buildings or the creation of new facilities within an existing historic fabric, sometimes a purpose-built facility is needed to bring new life to a specific area, town or city. An example of this is the Home Theatre in a previously neglected area adjacent to Manchester City Centre which was in effect created as a new focus for the community. At Space Architects, we led the delivery of this new build complex which incorporates a 500-seat main theatre, 300-seat studio theatre, five cinemas, 500m2 of contemporary gallery space, rehearsal and production spaces, as well as a large foyer with bar, restaurant and café, teaching rooms and all the associated back of house spaces. Such a wide range of facilities and users on a relatively constrained site had impacts on design, delivery and buildability. Every single theatre project we work on is different regarding the functional challenges to be addressed, the significance of the historic fabric and the skills needed to both analyse and identify opportunities. A common theme of the work we do with theatres, however, is the need to incorporate the various functions modern users demand along with high-specification technical facilities that function dictates into buildings that can date back centuries. We have to be careful to deliver an environment which appeals to the community, excites the audience and allows the theatre director to be creative. The magic of the theatre is definitely amplified by its setting and although contemporary facilities are loved by the community and are indeed often necessary for the theatre’s very survival, as architects and designers we won’t ever take anything away from the historic beauty of these magnificent buildings.